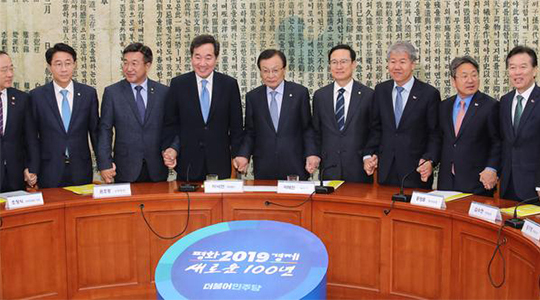 The South Korean government will propose an extraordinary budget in the scale of around 9 trillion won ($7.9 billion), more than doubled from last year’s addition of 3.9 trillion won, as the economy slows to a crawl due to contraction in exports. In a three-way meeting among officials from the Blue House, the government, and ruling Democratic Party at the National Assembly in Yeouido, Seoul, on Tuesday, Prime Minister Lee Nak-yon said a supplementary budgetary outline was in the works for submission for legislative review before the end of April. The extra budget estimated to fall short of 9 trillion won ($7.9 billion) will include 1 trillion won or more to tackle fine dust pollution. The increase on top of a record-sized 2019 budget of 469.6 trillion won will go mostly to propping up the economy, exports, and jobs. Public complaints over fine dust pollution that has made the air in Seoul and nearby areas the worst in the world in early March gave impetus to the call for an extra budget as well as growing concerns about the economy. After an annual review, the International Monetary Fund (IMF) last month suggested the Korean government to draw up an extra budget in order to achieve growth within target of 2.6-2.7 percent this year. The government’s extra budget proposal will most likely be submitted to the National Assembly on April 25. It will be the third time for the Moon government to allocate an extra budget on job creation amid deteriorating employment conditions. The government plans to expand spending for the social vulnerable group to secure income.